I find this shoes extremely cute but it’s not the only thing that made me pick this pair of pinks. The Dansko Professional Pink Ribbon Clog actually does more than provide protection to your feet, the pink ribbon is also a symbol of breast cancer awareness and you can spread it by wearing Dansko clogs. 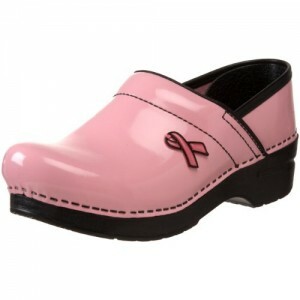 The Dansko Professional Pink Ribbon Clog went through Danko's slip resistant test and bears the brand's legendary comfort. The elevated, shock absorbent sole will keep you on the go. Dansko is made durable for long term wear. Its leather upper and fashionable platform offer low-key style while the shock absorbent sole and slip proof insole will keep you on the go. It has all these and of course it bears the legendary comfort the brand. Buy this Dansko shoes here!